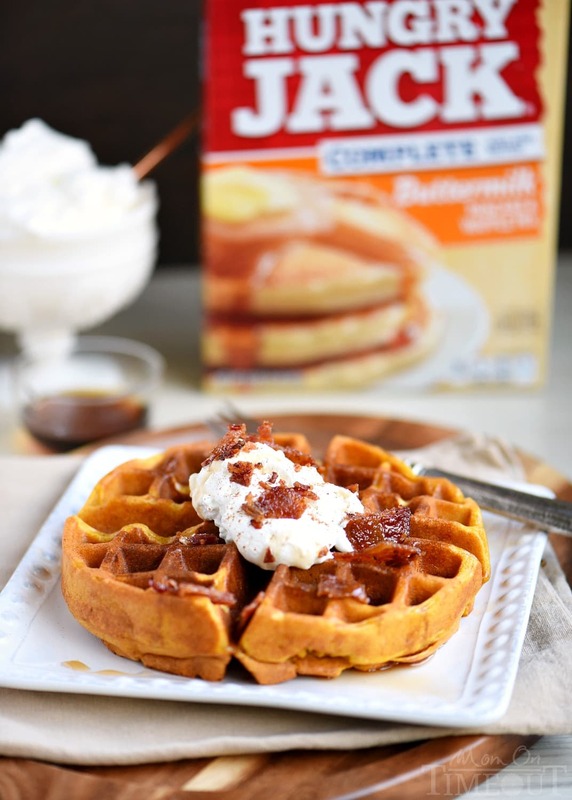 These Pumpkin Spice Maple Bacon Waffles are the perfect way to celebrate the most important meal of the day! Great for the holidays and all fall long! You’re going to love the spiced maple bacon that’s inside each waffle – so good! 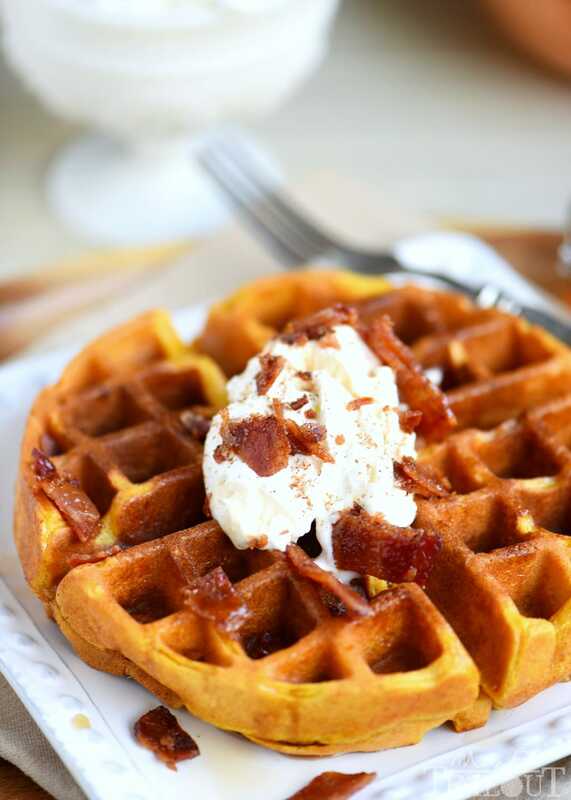 Tis the season to pumpkin all things…even waffles! Hi you guys! I’ve got a killer breakfast recipe for you today that is just bursting with fall flavors. Pumpkin spice, maple, pumpkin and BACON!! 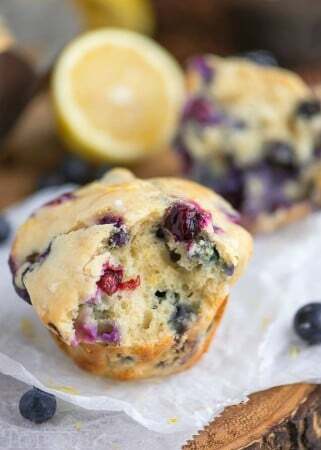 I can’t believe it either, but trust me, it’s our new favorite breakfast. Every year I share tons of great recipes with you for the holidays. I’ve got you covered on holiday sides, main dishes, and, of course, desserts and treats. My favorite meal of the deal hasn’t got enough attention I’m afraid, so today, breakfast! The first step is making the maple bacon and WOW, I’m going to be craving this bacon for dayzzz. The bacon is baked and intermittently brushed with a maple-brown sugar-pumpkin spice glaze. Your mouth just started watering, no? The bacon comes out so crispy and just bursting with flavor! The pumpkin spice was a moment of pure genius. Who knew cinnamon + maple + bacon could taste so good? Because the bacon requires a little bit of effort, I made sure to make the waffle batter a breeze. I used Hungry Jack® pancake mix to start it all off. Some pumpkin, milk, oil, and pumpkin spice are all you need to make these amazing waffles. Honestly, the waffles by themselves were so good they didn’t need anything else but heck, it’s the holiday season. We topped ours with freshly whipped cream, a dusting of pumpkin pie spice, more maple bacon and of course, maple syrup. You couldn’t have paid me to leave the table. Breakfast doesn’t have to be difficult or time-consuming…in fact, I think it tastes a whole lot better when it’s easy like these waffles 🙂 Take time to make breakfast with your family this season and don’t forget to use Hungry Jack® to make it extra delicious and easy! 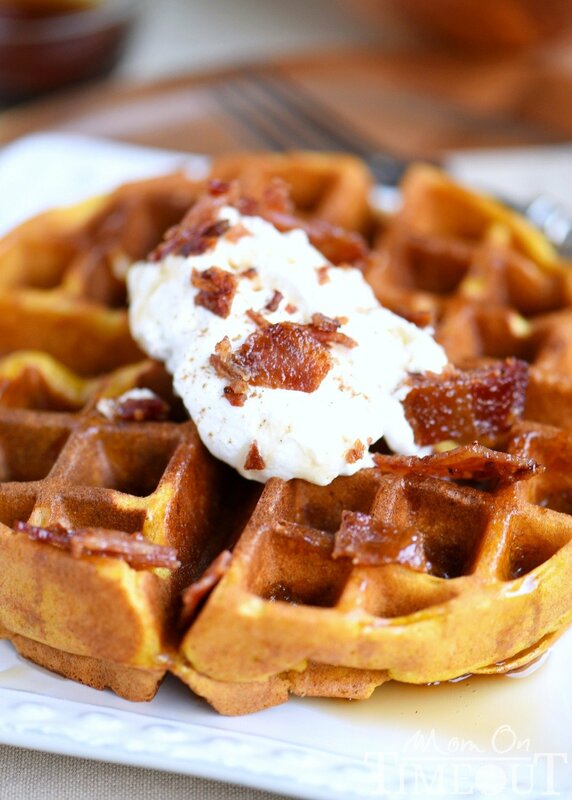 These Pumpkin Spice Maple Bacon Waffles are the perfect way to celebrate the most important meal of the day! Great for the holidays and all fall long! You're going to love the spiced maple bacon that's inside each waffle - so good! 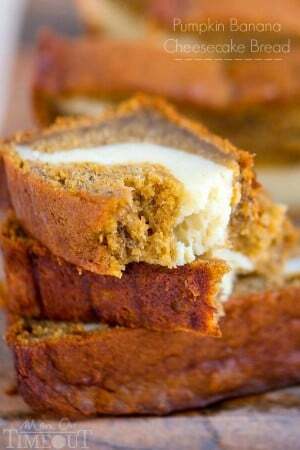 Whisk together the maple syrup, brown sugar, and pumpkin pie spice. Set aside. Place a baking rack on top of the foil and spray generously with non-stick cooking spray. Place bacon slices across the rack making sure to not overlap. 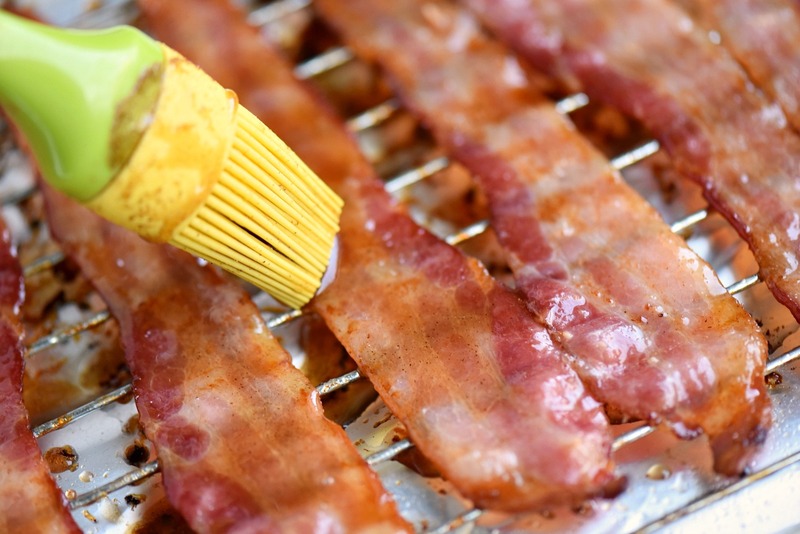 Carefully remove the baking sheet from the oven and using a pair of tongs, flip bacon over. Brush with the maple glaze. Roughly chop bacon into bite-size pieces. Reserve ¼ cup for topping the waffles later. Whisk together the pancake mix, milk, pumpkin, oil, and pumpkin pie spice just until blended. Preheat your waffle iron and cook waffles according to the manufacturer's instructions. I used a non-stick Belgian waffle maker that doesn't require any greasing. If you have an older waffle maker you will need to spray non-stick spray first. If you want to eat at the same time, and who doesn't, when you're done cooking the bacon, reduce the temperature to 250F. Place cooked waffles in the oven while you finish making the rest. The oven will keep them nice and crisp on the outside! 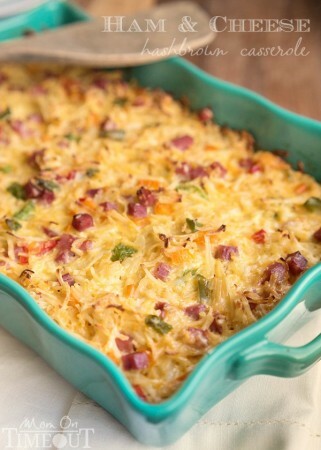 For more recipe inspiration, visit HungryJack.com! Looks great! Is it the regular pancake mix or the complete pancake mix? Wow, seems like a strange combo but I guess anything tastes better with bacon. Lol. I love the 50 holiday dessert ideas post. 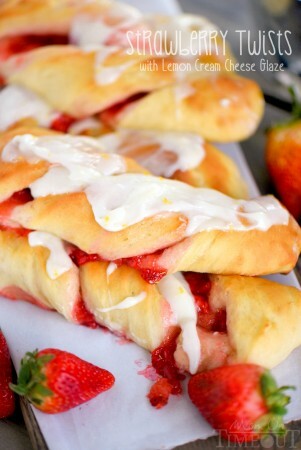 These need to be on my table for breakfast really soon! 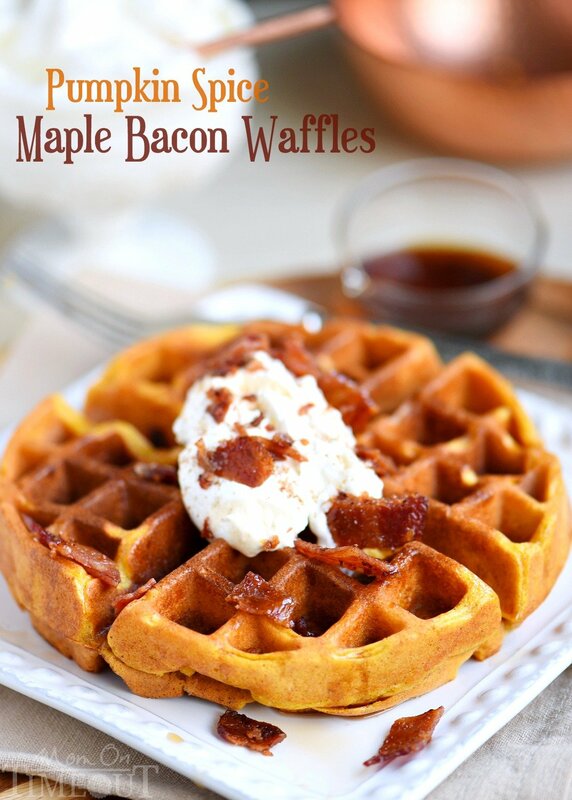 Bacon AND maple …oh and with pumpkin spice….I believe these could be pure bliss!!! These look beyond amazing. That bacon though! Thanks Dorothy! The bacon… YES.